A couple of months ago I read about an event at the Mendocino County Fairgrounds in Boonville. I had never heard of Boonville so I did some Googling to figure out where it was located. Turns out it is about 30 mi northwest of Cloverdale on highway 128, in the heart of the Andersen Valley wine region. Wikipedia informed me that Boonville (aka Boont) was named after W.W. Boone, a relative of Daniel Boone, and is apparently known best “as the source of the Boontling folk language”. The anthropology geek in me was intrigued. 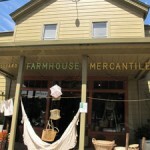 Last week we headed north for a short holiday in Mendocino and made a point to stop in Boonville to do a bit of exploring. It was the last day of the Sierra Nevada World Music Festival so the town was especially lively. Passing by the fairgrounds we saw a colorful array of music enthusiasts from a barrel-chested guy sporting a rainbow Mohawk to a pair Rastafarians with authentic African accents. Drums echoed through the streets; the stage was alive with entertainment in the distance. 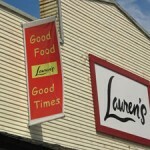 We stopped at Lauren’s for a late lunch. It was a lucky choice. I don’t know what they do to their French fries but I might make a trip back just to eat more. Walking down the highway we dipped in and out of the shops, trying to get a feel for the town. Boonville was full of contrasts. The ends of town felt more “local” but were interrupted by a restored stretch of historical buildings that housed more trendy eateries and shops. Near the north end of town stood a completely modern aberration, an austere stone walled wine tasting room. The quaint old Boonville Hotel seemed to stare at it indignantly from across the street. Before heading back to our car we picked up some snacks and coffee in Boont Berry Farm, a wholesome market with more character than space; the walls were lined with vintage refrigerators and freezers. The colorful array of buildings and shops reflect a town in transition; a once isolated borough with a history of logging that is gradually giving way to a burgeoning wine industry and the influx of visitors that come with it. 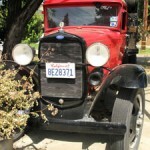 In our snapshot visit to Boonville we were left with a very good feeling about the town. It was friendly, had eclectic charm, and offered plenty of reasons to come back and visit. The valley has unique events throughout the year. There is a growing selection of wineries up and down the highway. You can taste and tour an award winning brewery. 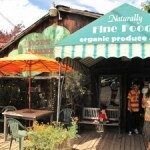 And, there are enough interesting shops and eateries to keep you busy and satisfied.